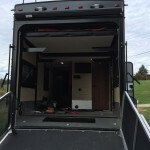 Since we brought the camper home, we have been packing and repacking to get things where we want them. In doing this, and in sleeping in it, two things have become apparent. 1. There is nowhere convenient to put the Synology File Server or the internet equipment. 2. 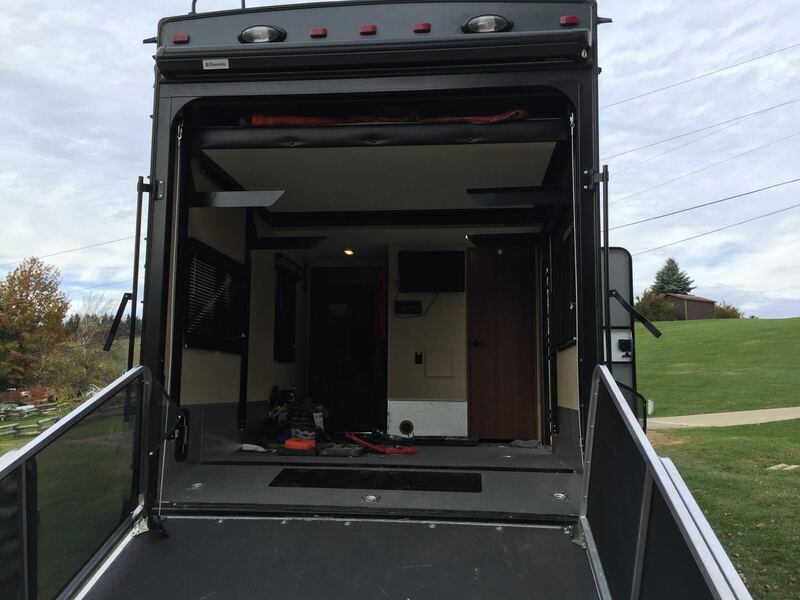 With the back room set up for our use, we have no use for the couches/lower bed that are in the toy hauler part of the camper. 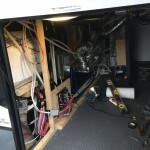 After much contemplation, it was decided to do some rebuilding of the back of the camper to remove the lower bunk and look for an area to put the server and internet equipment. 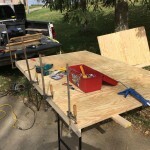 For the back of the camper, what I decided to do was to remove the fold down couches entirely, leaving the brackets, and, taking advantage of the lifting mechanism, build a tray that could be used for storage. This would give us a rather large area where we could store things that are bulky but not too heavy (backpacks, remote control trucks, legos) and could be lifted out of the way when not needed. 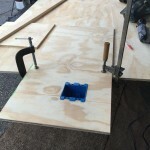 Because of the limited height that was available for the rear tray, I used 1×4 boards for the stiffeners and plywood for the base. 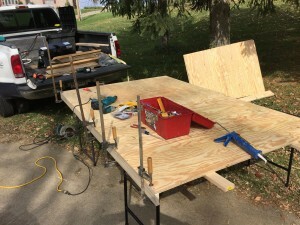 It was built with basic hand tools, glue, screws, and clamps, and could be replicated in a campground if necessary. 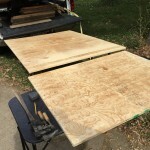 I did borrow a circular saw because it would make much cleaner cuts than my sawzall. 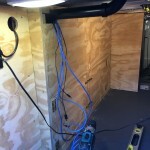 For the server and related equipment, I focused on the area in the basement of the camper. The piece that Jayco used for the bulkhead of this area was flimsy and not well constructed at all. 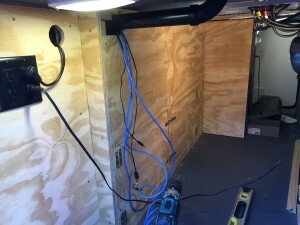 In our Bayhill, I was able to screw into this bulkhead and attach the router and wireless access points to it, but in the Jayco, this bulkhead is not strong enough to attach anything to. 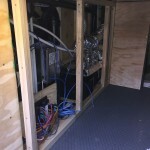 I removed it to look at potential spaces, and found a small space under the plenum for the heat and air system. 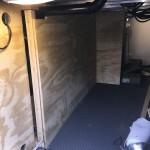 After finding this and realizing that the bulkhead provided by Jayco was for all intents and purposes useless, I decided to rebuild it into something that could have objects attached to it, would improve strength, and would allow access to the server and related equipment. I decided to use plywood and 2×2 bracing to accomplish this. 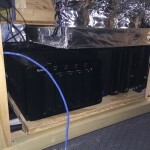 While the wall was constructed, the server was placed, network cables were run into the upstairs for the 5 Ghz access point and the Mac Mini, cables were secured for the link to the outside antennas, and the router and 2.4 Ghz access point were placed on the bulkhead. I also upgraded the plug so that we had 4 plugs instead of two, and I placed a uninterruptable power supply behind the bulkhead that the equipment is plugged into to handle surges and brief power blinks. The compartment light was also placed on the ceiling instead of the wall to give better lighting to the compartment and be out of the way. The tray for the back was also painted on the bottom and there are plans for the future for lights on the underside of it to make working under it easier. Since I had some plywood left from the first two projects, I also made a shelf for the closet in our bedroom, which now holds our printer, a lot of our recharging for small batteries and devices, as well as clothing. 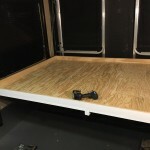 These two big and one small project have really changed how we can use the camper and have allowed us to get quite a lot of “stuff” put away and off the floor. We can now make the back of the camper into the classroom it needs to be for homeschooling. The kids will be thrilled! With the old bulkhead removed, the mess is visible.